Margo: Wayne has interviewed and photographed three of the four main rivals to Sophie Mirabella for the seat of Indi, Cathy McGowan, Jennifer Podesta and Robyn Walsh. This interview with Greens candidate Jenny O’Connor completes his task, except for Sophie herself. She has declined to be interviewed. Q- What were you doing before becoming involved in politics? A- I’ve been involved in politics for a long time. I’m a nurse, but I’ve been an activist since I was a young woman. I’m 52 now. I’ve been running at every election in this seat for the last 10 years. I’m on local government. I’ve had a career as a nurse and a councillor and worked on women’s services, but I’ve been involved in politics for a really long time. Q- Why are you running in the seat of Indi and what do you think is the most important issue facing its residents? A- I’m running because I think Sophie Mirabella is a terrible representative. She’s not representative of the people in this electorate, nor does she perform her job well. I think I would be a really effective representative for the people of Indi. There’s a number of really serious issues so it’s really hard to pick one. Clearly, the Greens are really concerned about a sustainable economy. Really into that comes everything, including things like broadband, climate change and how we manage agriculture, education, health and transport. They’re all part of it. That’s kind of a cheating answer because I’m not picking one. But I think that is the big issue for us, is how do we move into the future in a sustainable way, and so everything has to be taken into account. Q- Do you believe the hung parliament after the last election was a success and why? A- I think it was both successful and it had problems, to be honest. It was successful for the Greens. We were able to wield a fair bit of influence and get some very important policy through. The National Disability Insurance Scheme, the national broadband network (NBN), pricing carbon, come from the Greens’ support. So things we went to the election with we were able to do because it was a hung parliament. I equally think that what happened was the media, particularly the Murdoch media, got so carried away with the whole notion of the hung parliament and the politicking within the parties and between the players, that the whole debate turned into a circus. The real work of what should be done was lost by both the internal party crap that went on and the way the mainstream media played it. So I think we were very badly served by the media in the end. A hung parliament is representative. Q- A problem faced by most of regional Australia is attracting medical professionals and retaining them. What measures do you think would help attract and retain health professionals in Indi. A- It’s a multi-pronged approach, not just throwing money and saying we’ll pay GPs more to come and live here, which is what the Liberals are saying. To attract people into the area of health, you actually need to look at health itself. Things like primary health, the connections between health services, mental health, dental health, and GPs. One of the issues for GPs is they’re lumbered with everything and there’s very little resourcing out there to manage their patients, particularly in country areas. The Greens are saying we have to improve the whole system for health workers as well as patients, so people can work in those systems effectively. If you talk to GPs in rural areas, they’ll say pretty much it’s a nightmare. They get stuck with on-call work. The obstetricians and gynaecologists are all saying, we don’t want to do the babies, it’s too risky. So their problems are compounded and it’s very hard to attract them. There’s also about selling it. Living in the country has some fantastic advantages and we need to promote that as a great lifestyle as well. There are no simple answers to any of these things. Q- There is a perception in rural communities that many government services are hard to access. How can this best be addressed? A- Well, it depends on what level of government. I think it’s a reasonable perception. Things like broadband make a huge difference in that way of connecting and allowing people to access services that they otherwise may not be able to. The partnerships between federal, state and local governments are crucial, around how we can get local government to better provide services being funded federally or through the states, so they are accessible to local communities, particularly more remote and small rural communities. They’re very dependent on that. I know from being on local government it’s very hard to access adequate funding to do that. Q- Indi is an electorate with many pockets of small isolated communities. Many of these have high levels of unemployment and limited social opportunities. What role do you think the federal government can play in solving these issues? A – Again it’s not a simple answer. Firstly, you have to look at the driver of the economy in those communities, so if it’s dairy farming, you need to look at the duopoly between Coles and Woolworths for a start. How we change that so farmers are properly paid for the work that they do. We have to look at how we manage the resources, water, what happens in droughts. How we deal with natural disasters that are going to be increasing and how we prepare for those and manage them when they happen to us. Tourism is important. Education for young people, so they stay and are able to stay in their communities to access education. Again, broadband is crucial for this. So they don’t all leave for cities and never come back. Communities die out because they don’t have growth in those areas. You have to have schools available so people can have their children there. You need transport available so people can access work and kids can get to school. There’s no one easy answer to this, which is why I think health, education and transport all connect up under the banner of a sustainable economy. Q- What should the federal government do to help improve access to new communications technologies to boost marketing and productivity for rural businesses in remote locations? A- The short answer to that is the NBN – it’s critical, The Greens have supported it all along. We’re saying it should be rolled out immediately. It should be one of the highest priorities. The coalition’s policy is a joke, it will be absolutely ineffective. It might work in some inner urban areas but it’s a disaster for rural and regional people. The fact that they’re even presenting it as an option is an insult to country people. The NBN is the answer and we just have to get on with it and do it, and there should be more resources put in to that. It’s an opportunity to grow employment, it’s going to have an economic benefit for people where there’s high unemployment. It’s a win-win, but we have to call the government to account and do it. But at these stage neither are actually doing it. Labor’s talking about it, but so far it’s in 800 homes or something ridiculous, it just hasn’t happened. The Liberals’ policy is just a farce. Q- How can the federal government best support education in the Indi electorate, especially the smaller remote schools? A- Education is a huge issue for this electorate. The Greens’ policy on education is that it should be provided from the age of three, right through to tertiary and beyond. This notion now that you get educated if you can afford it and public funding being used for private schools – students going to tertiary education ending up with massive debts and often country kids are really disadvantaged. There has to be broadband available so kids can access education from remote locations. Adequate funding for public schools so we don’t have this two-tiered system. We support the Gonski review. 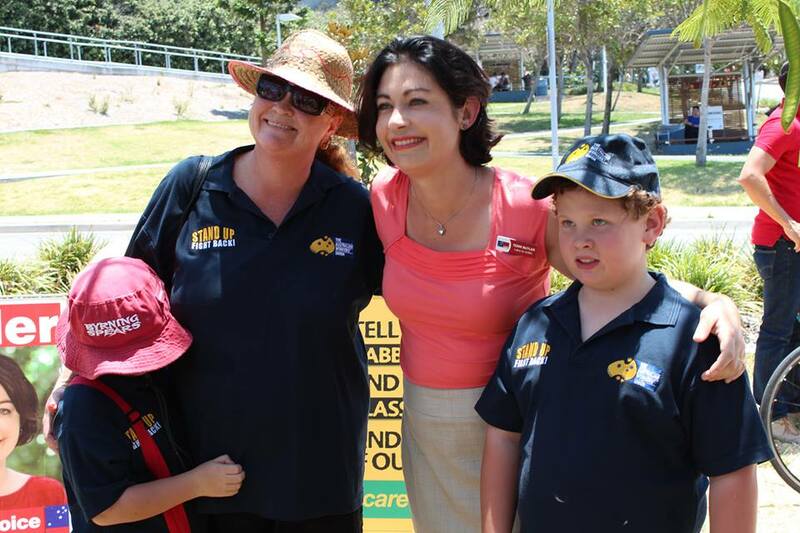 There needs to be early childhood education available and funded so every child has access. Q- Are you happy with the level of assistance provided to rural kids when they must move away from home to attend university? A- Absolutely not. Its one of those hidden issues that if people understood the real consequences of this, it would be a national disgrace. In my own daughter’s experience, off she goes as a young kid to the city, into a house. I can’t afford to pay her accommodation costs because I’m a single parent with other small children at that stage. She has to work virtually full-time to cover her costs, often shiftwork, trying to study with huge workloads. There’s a HECS debt on that as well, so she’s getting further and further into debt. A credit card to survive, I didn’t know about this of course, drug and alcohol issues, mental health issues, just a nightmare. I talk to parents with kids of similar age and this is a story happening across the nation, it’s terrible. People assume because kids have got into universities from the rural schools they’ve done well. But we need to support them down there and that does not happen. There’s all these strange rules and barriers such as if they haven’t worked for 18 months they don’t get income support. Kids either get into university and don’t go because it becomes too difficult. Or they get in and fail or it takes them a long time. They’re under enormous pressure just to pass a normal tertiary education. So, no, it’s not ok.
Q- Do you accept the accuracy of the science supporting anthropogenic global warming and why? A- Yes, because the evidence is overwhelming. It is a flat earth approach to say no. Virtually every scientist on the earth except for those funded by the vested interests are telling us this is the truth and we need to act. There’s just no question in my mind. I am not arrogant enough to say that I know more than the climate scientists from around the planet. I am amazed that people with virtually no knowledge whatsoever say they know better. It’s the most arrogant and ignorant position. Q- If you become the member for Indi, what climate change policy will you be supporting or advocating for? A- We have said that you must put a price on pollution. The Greens are disappointed to see the carbon tax being knocked off for no other reason than people don’t understand it. It’s got bad press and people are afraid of it. 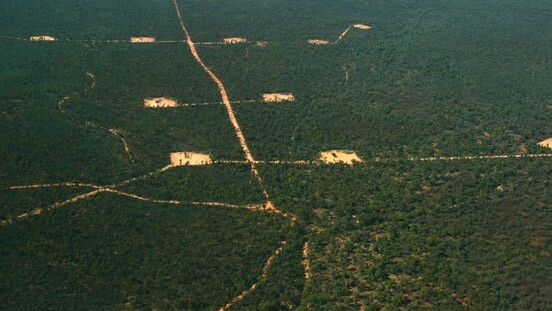 But in fact now that it’s been in, it’s had a real impact on the amount of carbon that’s being put into atmosphere. It’s having a very limited impact on the economy in the way people carried on about, the fear mongering that went with that. That Rudd’s turning to the emissions trading scheme means the price is much less, that means polluters can keep polluting because there’s no cost to them to do it, There’s no incentive for them to change their practice. That’s why the carbon tax is a good idea. Carbon tax is a bad name; it should be called a polluting tax because that’s what it is. We should tax pollution, tax the polluters and that encourages them to invest in clean energy. Which is a great thing for rural communities because that offers a huge opportunity for infrastructure and investment and growth for the economy as well as looking after the planet. Q- An increasing number of farmers who were once climate-change sceptics are becoming increasingly concerned as they experience problems caused by what they now believe is due to climate change. What is your message to these people? A- Get on board. The evidence is clear. We want to support farmers, we want to make sustainable agriculture practice a priority and support farmers in moving to that. This is our food – it’s crucial we support agricultural industries. We’ve been saying all along climate change is the biggest threat to the farming community. The Greens are there as a supportive party. In the past we’ve been set up as rivals and enemies, but more and more that’s changing. Particularly younger farmers, they’re intelligent, educated, they know that this is real and now they’re looking for ways of dealing with it. They’re actually the front line. If farmers change their practice and manage the water and their land in a way that’s sustainable, they are then the greatest advocates for how to solve the climate change problem. So we want to support them. Q- Did you agree with the commonwealth government intervening to stop Alpine cattle grazing and why? A- It’s a very emotional issue in this area. But, yes, I absolutely support it. I grew up visiting Harrietville as a young child and I loved seeing the cattle being driven through the town and up the mountain. I never understood why people would want to change this, it’s a very romantic notion, the Man From Snowy River stuff. I’ve spent a lot of time in Mt Hotham, and I’ve seen the damage from the cattle. But I never understood how serious the damage really was. I did believe the slogan “alpine grazing reduces blazing”, because it makes sense on a very obvious level if you remove the fuel there’s nothing to burn. But then I got educated about it and in terms of why I support our policy, the damage to the environment is irreversible. The biggest problem is apart from the damage to the structure of the peat moss and those things that are really fragile, cattle graze all the native flora. Introduced species get in and invade the park and they’re much more flammable. Therefore there is in fact a much higher fire risk from the cattle. So once people get their head around that, the slogan is actually wrong. Q- Why should the people of Indi vote for you? A- I’m an effective leader. I’ve proved that as a Green by being elected as a councillor in a very conservative electorate. I’ve worked in the community in all kinds of roles all my life. I know this area really well and I understand the issues people deal with. The Greens reflect my values and beliefs so I’m happy to represent them as a party. If they lost their way, I would leave. I would never support a party just because I always have. Which is one of the unfortunate things in politics. I’m an independent thinker. I also think it makes sense to have a party that can get things done in the parliament and Senate. That’s why I run as a Green and not an independent. Note: At the time of this interview Jenny O’Connor was not intending to direct preferences. Her position has since changed and she is now open to dealing on preferences. There is something vaguely sinister within our democracy when Mr Abbott can say that if we don’t give him his rightly deserved majority mandate we will all have to go back to polls until we get it right! 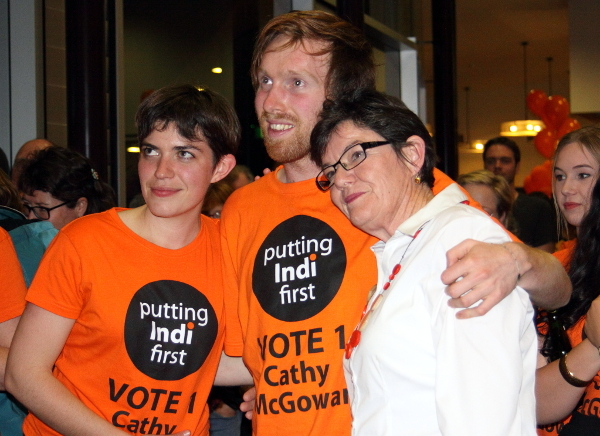 Thanks for a great interview – I’ve just read through the interviews with all Indi candidates, and am most impressed with Jenny O’Connor and Robyn Walsh. It’s amazing how strange it seems to read interviews with people who are able to both convey a sense of who they are and what they stand for, clearly articulating their positions and not peppering every answer with slogans and jibes. I’m in the Wills electorate (Kelvin Thompson) but would gladly vote for O’Connor, especially! I love Jenny OConnor’s grasp if the big picture AND the detail. I’ve heard her at a couple of the forums and she is really inspiring. Unlike Cathy McGowan who as a candidate is not living up to all the hype created by a slick marketing campaign. Don’t get me wrong, I really respect her as a person. I just don’t think she would make a good politician. Jenny OConnor looks like she could take on the big boys and girls in Canberra and not get eaten alive. How great to see Jenny O’Connor doing so well. She was my best friend in kindergarten and I haven’t seen her since, although I heard about some of her great advocacy work for single parents on the grapevine. Coincidentally I now live in Adam Bandt’s electorate and campaigned locally for him. Although it looks like Jenny didn’t win it’s great news that Sophie appears to have lost- yay for people power!